It was just over two decades ago that I first heard the macabre tale. I think it was described to me as a church "made out of human bones," sitting quietly in a small, unassuming country village. I'm pretty sure that I spent an embarrassing number of years thinking it was "in" Prague, that Prague was a country of some sort. Later I believed it was in Czechoslovakia, which was certainly an improvement. Unfortunately by then it was the mid-1990s, and there was no such thing as Czechoslovakia any more. I promise my grasp on geography is just a touch better these days. The story here starts in a marvelously medieval town named Kutná Hora, which is located in the Czech Republic (about 60km southeast of the city of Prague, actually). It was originally settled sometime in the 10th century, and in 1142 a dozen monks showed up to build a monastery in the small suburb of Sedlec. In 1278, the Abbot of the monastery was sent by the king on a diplomatic mission to Jerusalem. Before returning, he took with him a handful of earth from Golgotha (the site where Jesus was said to be crucified). 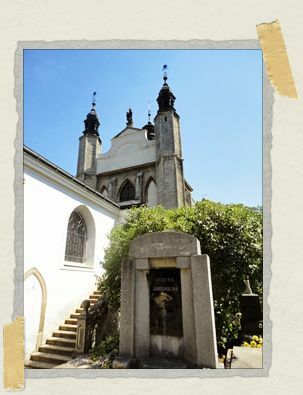 Upon arriving back home in Kutná Hora, he sprinkled that earth over the monastery's cemetery. This seems to have converted it to the 13-century equivalent of beachfront property for the deceased. 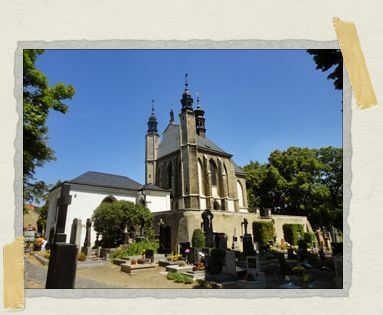 Suddenly, the Sedlec cemetery was the place to be buried, and everyone was trying to get in. The cemetery was enlarged, and then enlarged again. At around this time, a small chapel was built on the cemetery grounds. Not long after that, a little something called the Black Death showed up, and things began to go downhill. Things only got worse in the following century, as the Hussite Wars tore through the region as well, leaving countless more dead in their wake. And then to compound the problem, some of the grounds the cemetery had expanded into were "abolished", and the dead there had to be dug up and relocated. The little cemetery just couldn't keep up. Something had to give. 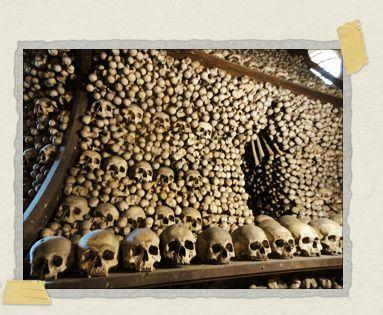 By the beginning of the 16th century, human bones were stacked in neat piles around the outside the little chapel on all four sides, and the monks decided to officially convert it into an "ossuary" – a building dedicated to serving as the final resting place of all these bones. 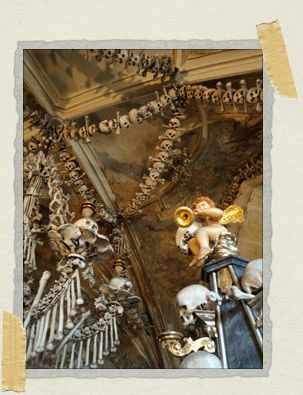 According to legend, the task of moving all of these bones inside the chapel and arranging them there fell to a half-blind monk in the year 1511. 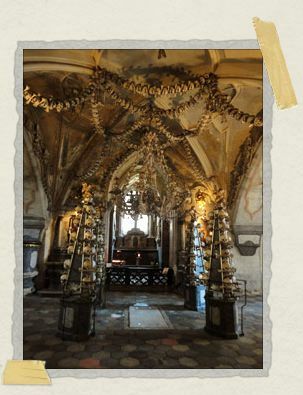 For over two and a half centuries, the bones remained piled in the chapel, with more and more being added each year. By the late 19th century, the remains of somewhere between 40,000 and 70,000 people were scattered within, a fact that soon came to the attention of the ruling Schwarzenberg family. In 1870, they hired a woodcarver named František Rint to organize it all. 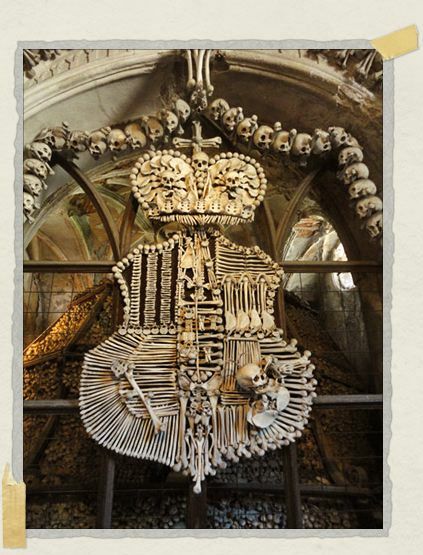 He spent the next decade working day and night within the ossuary, building what he felt was a "bone testament." The message he wanted the bones to tell was the central tenet of his faith: that death was as nothing before the power of Christ's redemption. In truth, though, as much as he was motivated by religious zeal, there was an undeniable touch of the macabre artist within him as well. He hung chandeliers composed of every different bone in the human body, built vast bell-shaped "charnel houses" out of bone in the four corners of the chapel, and spelled his name out on the wall in finger bones. When we arrived at last in Kutná Hora, I wasn't completely sure what to expect. I was about to see something I'd dreamed about laying eyes on since I was in high school. The thing is, I'm a bit of a different person now than I was then. The idea of huge piles of skulls stopped seeming "cool" to me around the time I set foot in the Tuol Sleng Genocide Museum in Phnom Penh, Cambodia. After that experience, it was hard for me to approach something like that without a sense of sickening horror. As much as I'd always wanted to see this place, I didn't know if I'd be able to enjoy it in the slightest anymore – I was worried it would feel exploitative, that it would feel disrespectful. I was worried that it would make me sad. So it was with rather mixed emotions that I stepped down into that cool, dry, quiet chapel. Maybe it's because in this case, these were all people who died hundreds of years ago, people whose deaths were a matter of the most distant history to me. The Khmer Rouge committed its genocide in Cambodia so recently that I was a small child playing with Star Wars action figures on the other side of the world when it was going on. Maybe its because in Phnom Penh I was face to face with the skulls of people who had been brutally murdered and then thrown unceremoniously into a mass grave. 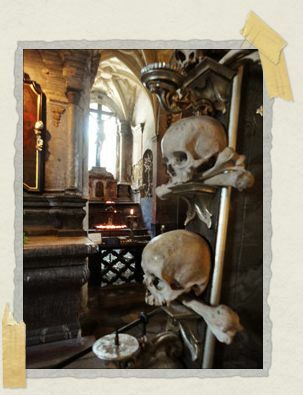 In Sedlec, on the other hand, I was viewing the remains of people who had lived and died and been interred exactly where they wanted to be. Or maybe it's just because in Cambodia I was witnessing a reminder of the worst of humanity, some of the darkest sins of our species. And here I was seeing us reaching for something spiritual, something reverent. Instead of feeling like a cheapening of death, what I found was a celebration of life, of tens of thousands of lives. It was so striking how completely different it felt to me that I had to sit for several minutes on the ossuary steps, taking it all in. Jessica and I were talking about it at one point, and I was mentioning how tremendously respectful it all managed to somehow feel. "And I realize I'm saying this," I said with a glance at the wall behind me, "standing beneath the place where he signed his name in finger bones." But as jarring as that juxtaposition is, the fact is that it all does feel respectful, both to the dead on display and the living who have come to bear witness to them. Coming so quickly on the heels of the powerful experience we had just shared in the ossuary, this one sentence had unexpected potency. It moved us both deeply, then brought the world into sharp relief again. Remember about the death, but be happy to live today. What an incredibly fascinating read/place. Memento Mori, indeed. Wow.. such a stark difference to Cambodia… and it is beautiful! Cool story, too. Love the sentiment of momento mori – something I feel sharply these days. I fell off your notification radar! Nope, you didn't, actually – we just forgot to send out a notification for this story. Sorry about that! What a fascinating read and a great evolution of life and death. It's interesting how something seemingly macabre can be turned into humble art. To quote a line from Rent (one of my favorite musicals) "live for today!" Glad you enjoyed it – yeah, I thought it was really fascinating how something that could have felt really gory instead felt, as you said, like art. Somehow I totally missed this comment earlier, d'oh! But yes: wow indeed! You guys would have loved it there.